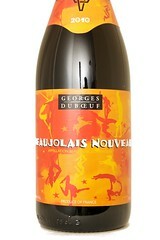 2009 Georges Duboeuf Saint-Amour "Cuvée Saint-Valentin"
This is how Nouveaux is supposed to be, but very very very rarely is! 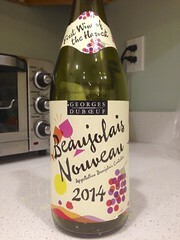 This new wine naturally settled in the cuve as the winter chill circulated through open windows for months, then it was bottled unfined, unfiltered, and unsulfured and shipped by plane in mid-November. 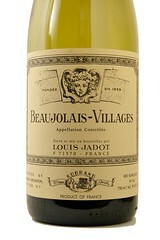 The wine was made with natural yeasts only and was not chaptalized. You are getting wine in its most natural state possible. 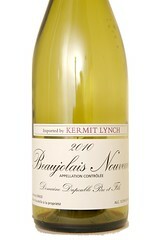 You don’t want to know what most people do to stabilize their Nouveaux. 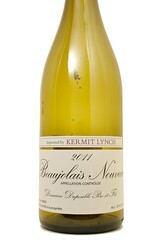 But this domaine doesn't worry, because their wine is drunk up so quickly. 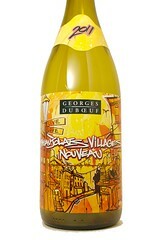 Besides, the Dupeubles know what they are doing; their family has been making wine here since 1512! 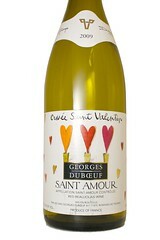 Georges Duboeuf Saint-Amour "Cuvee Saint-Valentin"
I CANNOT FIND! WHERE DID WE GET LAST YEAR'S NOTES??? 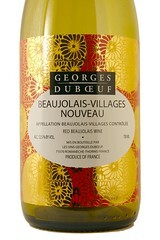 The Beaujolais Villages area is located to the South of Beaujolais, in the Rhone Department, close to Lyon. This wine is supposed to be drunk young although it can be kept easily up to 5 years or more. Very good, perhaps too good. 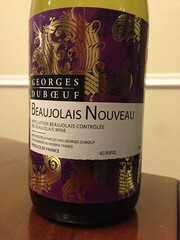 Don't expect Beaujolais Nouveau 2009 to reveal the characteristics of a jolly, precocious, acidulated, light Beaujolais Nouveau with amyl and, occasionally, redcurrant or wild strawberry aromas. It is more of a generous wine in which the grapes have been picked at an outstanding level of ripeness have produced some hearty, superb, well-balanced wines full of rich, smooth flavors. They have charm and class, they are hearty, flavourful, full-bodied, smooth and succulent, with very marked dark berry flavours: blackcurrants, bilberries and black cherries. 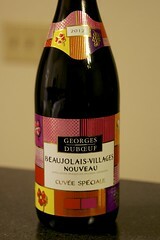 Beaujolais Nouveau 2009 is the vintage of excellence, the sort of vintage that you see once in a lifetime. It expresses the winemaker's satisfaction and pride. It will offer consumers quality that has never been rivalled before.